Taranis is the RAF/BAE fast-jet UAV prototype. The military is looking more SF every day. "Autonomous armed robotic systems probably will be operating by 2020, according to John Pike, an expert on defense and intelligence matters and the director of the security Web site GlobalSecurity.org in Washington." This prospect alarms experts, who fear that machines will be unable to distinguish between legitimate targets and civilians in a war zone. "We are sleepwalking into a brave new world where robots decide who, where and when to kill," said Noel Sharkey, an expert on robotics and artificial intelligence at the University of Sheffield, England. Human operators thousands of miles away in Nevada, using satellite communications, control the current generation of missile-firing robotic aircraft, known as Predators and Reapers. Armed ground robots, such as the Army's Modular Advanced Armed Robotic System, also require a human decision-maker before they shoot. As of now, about 5,000 lethal and nonlethal robots are deployed in Iraq and Afghanistan. Besides targeting Taliban and al Qaida leaders, they perform surveillance, disarm roadside bombs, ferry supplies and carry out other military tasks. So far, none of these machines is autonomous; all are under human control." And this is where the infantry are going - FIST - Future Infantry Soldier Technology, with a whole mix of networked technologies so soliders can have a HUD showing where their team-mates are (and their health/ammo state) and where the enemy is, and the view through their gun site - useful for shooting round corners. The radio data system even sounds like the sort of self-routing AX.25 system I used to demo at the School of Signals in the 80s. And here's the link to the similar US Future Force Warrior programme on Wikipedia, and a good vendor site on the project. And integrating AI into the system. The future of combat aircraft? Video report from the Guardian on the MOD Grand Challenge which was won by Team Stellar/Cranfield using a mix of robotic aircraft, helicopters and mini-tanks. Defense Review - DefRev Exclusive: FN P90 PDW Promotional/Sales Video. A replacement for the old SMG I assume. What is interesting about this and other weapons on the site is how they increasingly resemble weapons from Traveller, other SF RPGs and SF movies. The FN P90 even goes "byeond bullpup" (ie magasine behind trigger) by placing the magasine along the top of the weapon. Cracking article by the Guardian on the rise on unmanned combat vehicles. They reckon that by 2015 1/3 of the US fighting strength will be composed of robotic UCVs. Nick and I made it to Jena. Our hotel was in Apolda, but we spent Friday night in Jena having an excellent meal while Napoleonic soldiers marched round the town square. We spent the Saturday morning looking round Hassenhausen, with the bivouacs of several Prussian and French re-enactors still in place. The museum there was small but good. En route from Apolda we'd taken in a castle and an amazing water filtration system at Bad Hosen. It was about 400m long, 20m high, made of wood and stuffed full of fir branches. Trying to park at the battle site was impossible, every route in was blocked by police. In the end we abandoned the car up a side road, and just like the French on the morning of the battle legged it up the steep road to Closewitz. I don't know what I expected but the scale of the whole thing was big. The battlefield was a natural bowl about 1km on each side. It sat exactly where the first part of the battle was fought between Closewtz and Lutzeroda. There were around 2000 re-enactors and some 50,000 spectators. We eventually found a near front-row spot close to the main stand and got some great photos of the troops. At one stage the artilllery was just in front of us - an amazing sight. One of the reasons for being here was to get a feel for the wargaming issues,particularly visibility. What was immediately obvious was that altoughyou could see to the far side of the battle anything beyond 500m was just a blob, or a blob on a horse. Second was smoke. Even with 2000 men there was a lot of it. Cannon smoke tended to be concentrated and dispersed by the time of the next round (about 45 seconds, wind light to moderate). It was when the muskets started firing en-masse that the smoke became a significant cause of obstruction. The other thing was the troop density. This re-enactment had about 2000 men in 1 sq km. Just under 3 battalions. At Waterloo there were 140,000 men in 6 sq km, that's about 20,000 per sq km, ten times as dense. It would have meant (a) not much room for manouvre and (b) a lot of smoke. Midnight: Lannes 5th Corps and the Guard on the Landgrafenberg. Augereau's VIIth Corps coming up the Saale valley to Jena, Soult's IV Corps just clearing jena and Ney's VIth Corps just entering it. Napoleon's plan was for Lannes to attack at 0600, and then expand the bridgehead on the plateau as the other forces arrived. Lannes 22,000 soldiers attacked Tauentzien's 8000 Prussians and Saxons in dense fog by Luetzeroda and Closewitz. By 0900 the Prussians are in retreat and the French take the high hill of the Dornburg. Davout's lead elements cross the Saale at Kosen and climb to the plateau, running straight into Prussian troops at Hassenhausen. The Prussian are deploying poorly and failing to exploit their numerical advantage. To make matters worse Braunschweig, their CinC, is killed. Soult's IV Corps crests the ridge up the Rau valley N of Jena meet 5000 Prussians under Holtzendorf. After a fierce fight the French push through towards Vierzehnheiligen. Losses are heavy on both sides but the remains of Davout's III Corps is now on the plateau, and village to village fighting begins, going easier on the right thna the left. Hohenlohe has been waiting here with 20,000 Prussians since 9am when Soult and Ney start to attack. French cavalry persues the fleeing Prussians. An outpost of Saxons south of the Isserstedt-Jena road is attacked by Augereau's VII Corps and captured almost en-masse. A counter-attack by 15,000 Prussians under Ruchel fails and they are stranded under intense French fire, their retreat leads to an uncontrolled flight. The following days see the Prussian army almost dissolve as it flees North. Davout is in Berlin by 25th October. By early November the Grand Armee occipied Prussian from the Danish to the Russian border. The Prussians are fleeing North and West. Hohenlohe has taken up a position on the plateau west of Jena, almost half-way to Weimar to cover the retreat of the main body from the plateau to Leipzig, via way of Auerstedt. Napoleon is wasting no time in moving on the Prussians with Bernadotte's joining Davout at Naumberg, and Ney to Roda. But no sooner had the day started than Napoleon's intelligence informed him of the flight north by the Prussians so Davout and Bernadotte have been ordered to Dornburg, with the other troops concentrating around Jena. 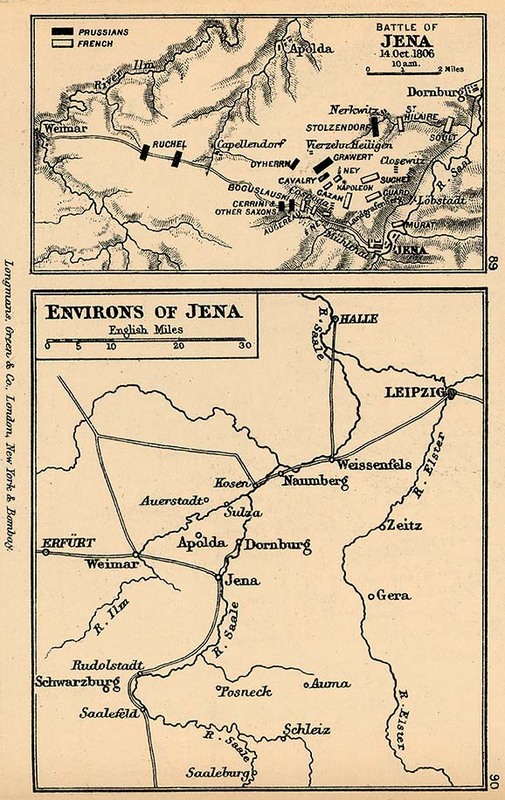 3 pm: Lannes in Jena was reporting Prussians north of Jena, and soon after the sound of musket fire could be heard on the ridge. Napoleon hurried the concentration, told Davout to be prepared to swing round onto the right flank and Bernadotte to be prepared to come to Lannes aid should fighting start early. 4 pm: Napoleon has reached the Landgrfenberg, joining Lannes. When Lannes had reached the plateau earlier that day he had driven the leading Prussian elements back to the villages of Lutzeroda and Closwitz. 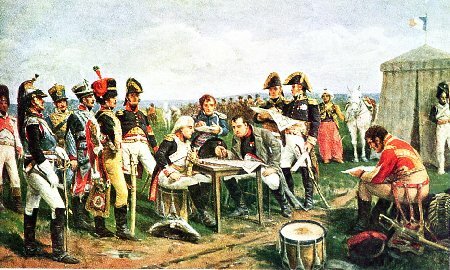 Napoleon is convinced that he is facing the main Prussian Army and has ordered the remains of Vth Corps and the Guard to join him after dusk. All other forces except Davout and Bernadotte are ordered to converge on the position during the night of 13th and early 14th, with battle to be joined some time on the 14th. Overnight Napoleon is working to pull the artillery up onto the plateau so as to be able to secure the Windkollen - the highest point there. This page is a archive of recent entries in the Military category.